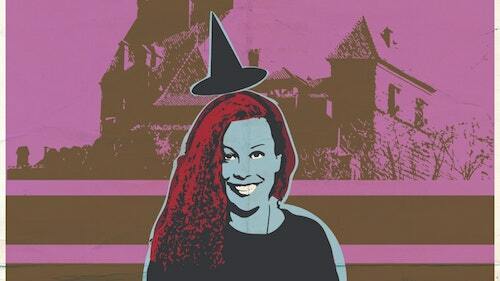 The eponymous Meg MacKay performs no discernible witchcraft in the show, so you can leave your summoning crystals and runic dictionaries at home. There is, however, a bit of magic at work, because MacKay’s somewhat aw-shucks storytelling style and her not-especially-polished delivery combine into a completely adorkable alchemy. She’s very funny, in the do-the-voices-and-make-the-faces kind of way but also with a sterling comic timing – no beat was longer or shorter than ideal. MacKay is with the audience in a very real way, in this show. Whether in building out the timeline of an abusive relationship or explaining her hasty decision to take a job as a cat sitter in Oman on a sort of anywhere-but-here whim, she’s not terribly different in style or affect than I imagine she would be telling stories at a potluck. Meg MacKay: Freelance Witch is a little short. I clocked it at 38 minutes from the end of the territorial acknowledgement to the applause, and I think here’s where a rigorous dramaturg could have helped matters. There are more details, more description, more atmosphere to go along with the plot that I think someone with experience working with/on solo storytellers could have helped draw out; there’s a robustness that the piece lacks so far. That said, it has an undeniable charm. I found myself rooting unreservedly for the show and the performer, both.